The weather was sort of inviting. It was so tempting to choose to stay home and just hug myself in my bed with my favorite pillow instead of going out somewhere. That gloomy day in December when everyone was doomed to be busy because of the Christmas season, and there I was – I was bound to go to the north. I wasn’t one of the contents of the shopping malls and luckily, I wasn’t also one of those stressed in the heavy traffic of the metro. So I packed my things as planned. It wasn’t a long time ago when I had my last getaway but this one is kind of something special. See, I was bringing my long pack. Yes, a long pack to suffice me for seven days! I was anticipating for this backpacking trip to happen. I couldn’t remember anymore the first time this one has been set on my mind. Nope, “ wala po akong pinagdadaanan, okay?” At hindi rin po ako brokenhearted.” Hahahha! In truth, it was the third day after my last day of work but I wouldn’t say it’s a celebration of freedom because it isn’t. All I know is that I would want to experience a real kind of backpacking. Maybe, the nature was like calling me to visit her (crazy thinking)… but the certain thing was, it’s a wanderlust! At first, I thought of backpacking the whole of Cordillera. I tried to make it happen by making further research which I thought of starting from Baguio (Benguet), Sagada (Mountain Province), Banaue (Ifugao), Tabuk (Kalinga), Kabugan (Apayao) and Bangued (Abra). Apparently, seven days are not enough and it could also be costly. More than these things, is the route concern. Yes, I was up to any tiresome trip then, but the fact that there is no direct trip from and to Apayao, and Abra should be traveled by doing some “merry-go-round” via Cagayan and Ilocos regions, I should accept the fact that one week is impossible for this plan. So I had no choice but to stretch my timeframe for this and spare more funds. Now, the hesitations got stronger, but these were given final decision when I decided to join an outreach in Kalinga led by TREK (Trail to Empower Kids). So I wanted it to become the finale part of my 7-day backpacking. That said, I can only cover Apayao and Kalinga. 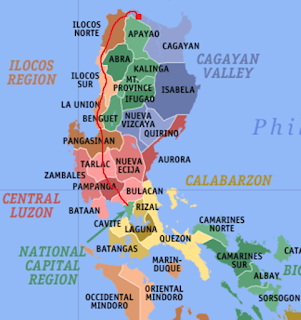 I decided to prioritize these places as these are two of Cordillera provinces that I haven’t reached yet for the time being (well, for Abra, maybe I could just have a side trip of it when I re-visit Ilocos Norte in the future). I had to call my trip “Backpacking Kalinga-Apayao” despite being Apayao as the first one in my itinerary. Well, perhaps it’s better to be called like that as they used to be. They were once one province not until they were separated into two provinces in 1995. A few [and not so detailed) information can be found in the internet about Kabugan, the capital town of Apayao. One “super” detailed one that caught my attention was about Luna, Apayao. It appears to be easily accessed as compared to any other areas in Apayao (thanks to lakwatsero.com). Apart from the accessibility, it fitted my timeframe, so this became the only place I visited in Apayao province. Then it was followed by some areas in Kalinga. So all was set. The next thing I should have: courage and passion. Courage, because I would be solo for the first four days of the trip and only in my fifth day would I be meeting up with my TREK companions for the outreach part. Passion, because I had to maintain my hunger and burning desire to travel and discover. “There’s no turning back,” I told to myself. I got a cab that could bring me to RCJ Lines (near Espana, Manila) where there’s a bus trip to Junction Luna. There’s actually another bus called Florida that transport to Junction Luna. In RCJ, there are only two bus trips to Junction Luna, 4:30PM and 6:30PM. I bought a ticket for the first trip considering that I could start the tour early and be within my itinerary the next day when I arrived. The cost of the ticket is PHP650 (as of December 2015). On the first bus stop, around 8PM if I could remember it right, I only had a restroom break but I did not went out of the bus to eat with other passengers for a dinner. I had baon. Hehehe! This was a part of my frugal kind of backpacking. Seated at the right front seat of the bus near the window, I felt something weird (fine! I'm weird, hehe!). Yes I am used to a solo bus trip since I normally travel to my hometown by myself. But this one was different, I didn’t have a concrete idea of where I am going. I only rely on the internet and my pre-arranged homestay with the contact person whom I also got through the internet. Everything was first time. I could not also answer directly whenever anyone asks me why I am going to Junction Luna and Apayao eventually. See, there could be no issues had I been a regular visitor to the place. But I think what makes it more difficult is because Apayao is not yet a popular tourist destination. With my long pack and this sudden “solo” visit of the place, it was so weird. I was so weird. Now the only thing that makes them satisfied to hear is that I told them I’m a blogger, which is true. But to me, this Backpacking Kalinga is deeper than the blog post that I would make. As I went on that long bus trip, I knew it was even more than the wanderlust, it’s more of a retreat for myself. I wanted to recollect myself as I start with the new chapter of my life after my resignation from work. I wanted to be whole by doing this for myself before I embark on new challenges ahead. I thought the bus route would be on the other side such as Ifugao areas, but it was not. 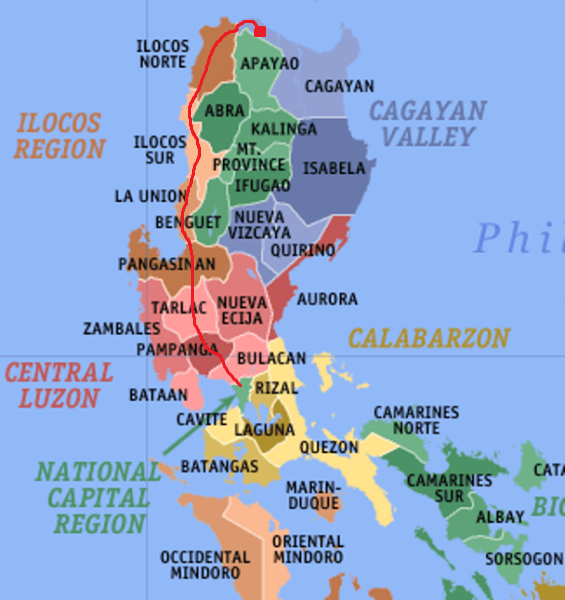 The bus passed through the provinces in the west including Ilocos Sur and Ilocos Norte and making a right turn (which would make me on top of the Luzon mainland) to Cagayan Valley province. Imagine, I left Manila at 4:30PM the last day and we were still in Claveria, Cagayan at around 7AM. I was wide-awake from that point that I made myself secretly smiling on the knowledge that I’m on top of Luzon mainland. It was a beautiful morning. I’m sorry for that shallow happiness, but I was really happy enjoying and witnessing the sunshine spread on that rare morning. Wow, it was a whole new destination for me. A new experience! The bus finally arrived at its final point, the Junction in Abulug, Cagayan. Surprised that there’s no direct bus route that would enter the province, I hired a tricycle that would transfer me to Luna town proper which costed me PHP120. So I had this snapshot of the entry to Apayao. I was entertained by the fact that this is a very unusual entry to the Cordillera region. I am used to entering the said region through Benguet and Ifugao provinces with a cold weather wrapping my body. So this one was totally different, really “not your ordinary entry to the province.” And I couldn't feel any cool breeze! I was dropped off in front of an elementary school because it’s near the lodge where I would be staying at. No, you would not see any indication or signage of that lodge. It’s a very small town and it’s unusual to see a building advertising to the public that “hey, this is a lodge!” Or so I thought… but during that time, I wasn’t able to see anything like that. Wow, the place is so laid-back. I loved it! I was in touch through mobile phone with the owner (Ms. Mircha) of the lodge because she’s in Manila and she just endorsed me to her mother (Mommy Mila) who oversees the property. I also asked around and was directed to go in that side of the elementary school. Mommy Mila and her nephew, Sir Nar, met me at their house and then brought me to the lodge. I just fixed my things and got ready for the tour. That feeling when you’re slightly not actually a tourist of the place but just like you’re a relative visitor from Manila that they would accommodate you and would want you to visit the beautiful spots in their place. I felt like that. They also found a guide for me. His name is Jordan who’s having his motorcycle for the tour. So it’s a habal-habal kind of exploration! Here you go and here is my version of Eat, Pray, Love... nope, mine is Explore, Pray, Love and the experience was like no other. At 9AM, before heading to the exploration proper, we dropped by at the local tourism office to register myself and also asked the people there to for an additional advice to our itinerary for the day. So the haba-habal journey begins. With a typical province scenario, I loved the simplicity and serenity of the place. Perhaps, its proximity to the Cagayan province and since it’s almost the entry/exit at the northern part of the Cordillera region is the reason why the classic mountainous and chilly place is not what Luna is all about. Despite some hilly places around, you would normally find flat fields instead. We went to the Marag valley first in which Jordan said we can visit more areas to explore. It’s almost 30-minute ride going there. There’s a majority of constructions along the road. Good thing to see this initiative to improve the transportation. By the way, there is no mobile signal on this place. The sun has risen completely and I could feel the hotness. I said to myself, "be ready for the sunburn!". I knew that it’s more of nature trip but I never thought that it would be a haba-habal adventure and still has many instances of trekking. So there you go, just when I thought I was ever ready. Hahah! Our first stop in Marag valley is the Rock Formations. We were not able to get an additional guide because there is no one available at the tourist information center at that time. We left the tricycle on the riverside, crossed the river and started trekking. Ooops I got startled and nervous upon seeing a dead snake with the same size as my arms. Whew! What am I doing? If I got into trouble, there’s no one to blame but me. Yet I was reminded, this is part of the adventure. We had a 15-20 minute hike to the rock formations. Good thing I wore a pair of sandals that I borrowed from my sister. Good thing also that I didn’t wear just slippers. It was so nice! Had I worn my trekking shoes and pants, I would have climbed further and until almost top. Next stop is the wooden hanging bridge. I forgot the name of the bridge but I think it’s a private property. If I am not mistaken, the river flowing here is connected to the Chico river, a giant river known in Kalinga province. So I met these locals seated and very relaxed in a little nipa hut where they maintain a logbook. Then we headed to a cave. The way to the cave is not established. One has to climb on a messy path, actually Jordan had still to trace the trail. We were able to find it but I decided not to go further because my head lamp seems to be not functioning well and my cellphone light is not enough. But look at this, that cave seems so huge. At this point, I felt like time was slowly passing by. Three spots down already and it’s still 11AM. I was asked if we should be still heading to the underground river. Of course I would go for it but the guide did not tell me that it would take us almost 2 hours of trekking. And it’s not the normal trekking because almost all the trails are river. Or if not river, it’s a muddy trail. I was a little annoyed at first but again, that’s part of the adventure! This was the point that I’d like to plunge on the river only to know that there was a carabao nearby enjoying his bath. LOL! Finally, we arrived at the underground river. Unfortunately, we only got to see the front part using the boat. Honestly I was a bit coward at this point. Reasonably coward I guess because I was thinking we were not able to get a guide on this place and if something happened to us, no one was there to rescue us. By the way, it was past lunchtime and thankfully I brought enough trail food. We trekked back on the same path… river and muds again were all that we encountered. Afterwards, we’re back at the town proper and ate real lunch at around 2:30PM. We headed next to the other side of Luna, so the habal-habal journey continued. Honestly, I was already tired but I guess I can still spare more energy for the last two destinations. Besides, I still find the habal-habal ride a relaxing one because I got to see more of the locals and their communities. Finally we arrived at Bayugao Falls. It may be rough roads going there but I was surprised because the stairways going down to the falls itself is already established and preserved. We headed to the last tourist spot for the day - Lussok Caves. It was already 4PM and according to the tourism officer there, their cut off for the visit is at 4PM. At first, the tourism officer just introduced me more about the caves and showed me the entry point. However, the guides and boatman there decided to tour me anyway because they said “sayang yung punta!” I was so delighted. They toured me while boating and afterwards, we explored the caves and did spelunking. Like any other caves in the Philippines which I have been to, there are lots of stalactites and stalagmites. This cave, by the way, is so huge that it is actually multi-chambered. Should we had more time, I would have explored more parts of it being accompanied by my guides who are both students. What amused me the most is the sparkling and shining parts of the cave which all of us were all cautious not to touch them so that it’s glittery portions will be preserved or will not be vanished. It was past 5pm when we went out of the cave. I enjoyed not only the cave but the company of these two student guides. Jordan just brought me back to the lodge and I called it a day. It was a day of many possibilities. I was able to explore more of Apayao which I never had any idea before. This is the lodge where I stayed overnight for only PHP350 - a unit with kitchen, own restroom and one bedroom is more than enough for me but because I was only one accommodating this, might as well maximize its use. Actually this unit can serve to up to 4 people or more. I was glad I had at least 7 hours of sleep the last night. I needed that… sooo much. But I also needed to get up early like 5:30am because it’s my travel time to the second and last leg of this backpacking – Kalinga. And so, this day was a mobile kind of day. Thanks to Sir Nar for sending me to the van with trip going to Tuguegarao. Yes, there is no direct trip to Tabuk City from Luna. It was almost a 2 hour-drive. Most of the time I was asleep and then later on realized it was 9am and we’re already in Tuguegarao. I was dropped off at Brickstone mall where the terminal going to Tabuk is. Unfortunately I never got more time to have a decent rice meal which I would want to have as early lunch. I’m afraid I would waste more time waiting for the next trip. After buying a loaf of bread and bottled drink, I immediately saw a van which easily got full. I didn’t have to wait that long because it ran right away after getting complete of its passengers. I was really expecting for an early arrival to Tabuk and be ahead of the plan, when the van suddenly stopped. The driver asked the front seater to get off for a while as he had to fix something under the front seats. Not more than five minutes, we saw some water rising and the first thing we all had in mind was to be out of that van right away so everybody got panicked. I was in the third row and swear, adrenaline rush was not that effective, it was so hard to get out. I even had a small bruise in my left arm when it crushed with something inside the van that I couldn’t remember anymore. Oh my, that moment when I couldn’t do anything! Funny, but I whispered and surrendered to God everything, I was ready for anything that could happen that time. I was completely sure that anytime it would be like in the movies when we will be burned after an explosion. In my last attempt, I succeeded to get out that my face almost hit the ground. Hehe, can you imagine? One of the passengers that I talked to, said the vehicle got overheat and it’s normal that whenever the driver does something like.. oh I couldn’t remember what he exactly said (it’s an auto thing and I don’t have any idea when It comes to car). After hearing that, I was like, “oh maybe my thoughts a while ago was all exaggeration. Haha!” But I was not the only one, maybe everyone was also in shock and unaware of such kind of cases especially when you get to see water rising (that everybody mistakenly witnessed as smoke) would also behave like that… funny. But no, that was never funny as the van wasn’t really in good condition. The waiting moment for the vehicle to get fixed wasn’t felt that much by me because this passenger that I’m talking to, whose name is Ross, was surprisingly going to Buscalan also. Sitio Buscalan is in Kalinga and this was my first destination in Kalinga province. Unfortunately, our schedule did not meet as he first needed to do his advertising job in Lubuagan, one of the towns in Kalinga. We also talked about climbs and travel as we are both into it. He asked this because he saw my long pack at the back of the van. I was delighted at first because at least I won’t be alone but just like what I said, our schedule did not match. I had to follow my itinerary because if not, I would be behind the schedule of TREK outreach and so I won’t be able to meet my fellow volunteers on Saturday. And then I realized, solo backpacking must be exciting and sort of a mobile but I guess, sharing with the company of a friend or friends would still be a better idea. When I got to talk to this person, I became more human because I got to share stories and laughter. Unlike when I was doing it on my own (no, not that I’m talking to myself), what I mean is, when I’m being solo, it’s just that and nothing more. Now, Ross mentioned and suggested that maybe it would be better to talk to someone in the tourism office in the town of Tinglayan (where Buscalan is located) so that I could get more practical advice in terms of guideship and guide fee. Honestly, I have a contact person that I spotted in the internet. It’s a backup though. Ross gained my trust in this case because I could see that he’s used to this place (especially Tabuk) more than I am. So I decided to listen to and stay with him even until our transfer in Tabuk. Finally, the trip continued after fixing everything. While we were approaching the city of Tabuk, I got amused of a very peculiar and interesting cemetery. I actually heard this earlier when I overheard from our van driver going to Tuguegarao, so the driver was right). We arrived in that city at around 12nn. Again, I didn’t have a decent meal as we need to transfer right away to the next ride. If I hear it right, this is a kakanin called "tudok"
In Tabuk, we dropped off across the St. William’s Cathedral then I decided to follow Ross where he encouraged me to go with him at the jeepney terminal going to Bontoc. This trip will be passing and dropping passengers in Tinglayan. As for him he would be dropping off first in Lubuagan town for his work. We had an ample time to talk about many things – travel, career, politics etc. I thank God because he sent a sort of friend to me that could make me sane even for a while. Otherwise, I could have a frozen saliva for not talking for 3 hours (Unless the locals who were with me in that trip care to talk to me). We actually left Tabuk at 1:15pm, yes we waited for more than an hour before the jeepney got full. Ross was in regret because he did not bring his things so he was thinking he could follow me after his work. At least it would be a big help to a budget trip since we can share on the guide fee. But I also doubt that, as bus trip schedule is limited so he cannot just wish to switch to another place right away. As we part our ways in Lubuagan, I was saddened because I do not have “kakwentuhan” anymore. I realized, hindi naman pala ko introvert kasi nalulungkot ako pag walang kausap. It’s just there are times that after being exposed to people, I just want to be alone. I just need that moment of solitude. Ross told me to text him especially about the guide, but I replied, “we’ll see, I could inform him if there’s a mobile signal. I observed that in most of the travel time, I didn’t have a Smart signal. After he dropped off at that point, I asked a woman beside me if it would take that long to reach Tinglayan, and she said it would only be a few minutes. Then some of the locals around started to make fun conversations particularly some old men. They teased me a lot but the woman told me that they were just kidding. Honestly, I wasn’t afraid, but found it also fun to be with them; at least the whole of the trip I got to talk. I don’t know if it’s true but they also told me that when I arrive in Buscalan, tell that I’m already married so that I wouldn’t get teased, which I guess would make sense. Hehehe! I arrived in the poblacion area of Tinglayan at 3:30PM. I asked around at the Inn called Sleeping Beauty Inn. The woman introduced me to Kuya Francis who is one of the popular tour guides there. However, Kuya Francis didn’t want to guide at that time as he told me that it’s almost 4PM and there were also too many people at homestay up in Buscalan. He advised to instead get a room for an overnight stay and we agreed to see the next day at 7AM and head for Buscalan. The owner of the Inn gave me a room costing Php400 (yeah, kinda expensive for a lodge but originally the offer is PHP800 but Kuya Francis helped me negotiate with the owner). Now the bad part is… Smart has no signal! Grrrr… Kuya Francis mentioned that only Globe has a signal in their area. So after having my early dinner (yes, finally I had a decent rice meal), I tidied up myself and settled in my room. The room given to me was one of those in the baseroom (there’s a baseroom because in this area is already mountainous). Now, to describe the entire picture.. I was in a very quiet and secluded place. And take note, there’s no mobile signal. Oh I remember what Ross said. Maybe it’s okay that he would not insist anymore to join with me going to Buscalan so that I could have more time to reflect (waaaah I guess he must be thinking that I am sort of brokenhearted or whatsoever). But anyway, you know what, I eventually loved the idea. This was a very perfect timing to have a silent prayer. I completely owned the moment and there was no distraction. My excessive thoughts would only be the distraction. So I got my pen and notebook and I wrote all my realizations and thoughts. After that, I looked up to heavens (literary ceiling above) and thank God for everything. I also remembered my friends and loved ones and prayed for them. I also lifted up to God all my fears and aspirations particularly that I’ll be having the total change in my life next month (which is already next year). I must say I had a good night sleep but it wasn’t a continuous sleep though. Not because I was disturbed l but maybe I had a feeling that I was really looking forward to hiking to Buscalan the following day and I can hardly wait so 8 or 9 hours is too much for sleep. Or maybe, I just couldn’t distinguish whether it’s already morning or still night as my rented room as mentioned is at the bottom part of the inn. I had my 3rd waking hour at 2am that I mistakenly thought that sun is already up. On my last waking, it was just in time but I was a bit sad because I could hear the tickling sound of rain through the roof of the inn. To my mind, how unfortunate that I wasn’t able to follow my schedule the last day of having a homestay in Buscalan instead, and now it’s raining. How could it be possible? I shut that negative thought right away. In fairness to me, from the beginning of this backpacking, I was able to always stop the negative and hysterical reactions. Perhaps, I am always reminded that I came here to have a good time, relax and mind not the problems. It was 5AM then, one hour is enough for preparation as my things are already in place and ready. Or maybe because I was perfectly in control of my things… can I say I am good in packing things? Shame on me to ask that! I should also say that the worst thing about me in packing is that, even if I don’t forget to bring the necessary stuff, meaning I am ever ready for everything, I always forget in which part of the backpack did I put a particular thing. So what better way to find that thing is to bring out all my things from the backpack… even in the middle of the road. I’m exaggerating. But still, what a waste of time! Hahaha. Grabbed the towel and started taking a bath. After all the preparations, I went to the dining area hoping that the inn is serving breakfast. They are, but I guess the food was still from yesterday. So I came back to my room and got some loaves of bread (they are not yet expired), and 3-in-1 coffee mix. A bit disappointed because prior to going here in Kalinga province, I was anticipating for a very ideal and relaxed early morning. This particular morning would have been sipping that famous, native Kalinga coffee while embracing a cold breeze and viewing from afar that wonderful Sleeping Beauty Mountain (Mt. Patukan). Whew, if only things fell at the right time similar to my itinerary. Now I’m only had the 3-in-1 coffee but still I had the window and I could view the Sleeping Beauty mountain. I was still delighted from the inside though, while sipping the coffee and while waiting for Kuya Francis to arrive. A jeepney stopped in front of the lodge before 7:30am. That trip is actually going to Bontoc, Mountain Province but as Kuya Francis said, we would drop off at Bugnay. That seems to be the jump-off point up Buscalan village. He told me that from there, he would ask another guide to accompany me. He would be meeting a foreign tourist in Bontoc and that is why he would not be able to be my guide himself. Well, the arrangement was fine for me as the game plan for that day was really sort of a short visit. After picking a guide for me in Bugnay it would be a “time is of the essence” trek and just a “say hello Whang-od.” kind of visit. He said I need to be back in Bugnay and catch the 10:30am bus stop or whatever is having a trip going to Tabuk City. Anyway, they say if ever I won’t catch up the regular trips, perhaps I can ride in some private vehicles. But of course, I’d like to catch the regular bus trips. So I had a preview of what would it would be like for the first half of my day. But the 30 minute-ride was awesome and somewhat surprising. So the road trip yesterday continued. The scenario: jeepney was full of busy locals delivering items of whatever business they have; some just transport to another place or maybe a day for them to visit relatives in another place; only three of us I guess were related to travel – me going to Buscalan, Kuya Francis being a tour guide and a German going to Banaue. For a short time, I was able to have a small talk with the German traveler. He was also travelling solo. I reached Bugnay and Kuya Francis referred me to a guide named Dalingay or Dany (0909 552 1591). And because we need to beat the 10:30am trip to Tabuk, I agreed to take habal-habal instead of trekking it. Now it costed me so much. In many cases, money can indeed buy time, I guess. Wow, so time is so expensive. We’re two and we need two motorcycles, but these motorcycles have drivers. So the the habal-habal rent costed me twice the amount. Well, never mind that anymore. At 8:35AM, Kuya Dalingay and I reached the point when we had no choice but to trek. The paths are narrower and already both up and down trails. I have no problem as of course, I’m obviously used to trekking. It took us around 30 minutes going up. On my first step ascending the said village, the first thing that I saw was the school. I was a bit amused on the simplicity of this little village. Greeted by some residents and then finally I saw Whang-od (Fang-od) a few steps from her home. She was sitting and combing her hair. Before I got near to her. I heard from Kuya Dalingay that she’s sick and she’s actually having rest. Her two granddaughters actually was taking charge of the people queuing for the traditional tattoo. So what I did was greet and smile at her, had a small talk and told her, “No, I went here not to get inked but just to take a picture of you, because you’re a legendary. I saw you on TV.” I saw her shyly laughed and uttered something and Dalingay interpreted that Fang od was telling she is ugly. Upon hearing, I told her, ” no, you are beautiful”. I was further amazed when I asked her about age, she’s freakin’ lively at 98. (Well upon posting her photo in the social media, one of my friends commented that she looked stressed and far different the first time he saw her a few months back). Maybe she’s too tired to cope up with tattooing which is said to be a regular 6am to 4:30pm session on a daily basis. We had to converse with Fang-od that short so that she could really rest. Kuya Dalingay told me to see the tattoo sessions on the upper part of the village. I believe Fang-od was made famous because a certain feature on TV that dubbed her as the last Mambabato (traditional Kalinga tattooist) from the Butbut Kalinga people and the oldest tattoo artist in the Philippines. Her tattoo ink is composed of the mixture of charcoal and water that will be tapped into the skin through a thorn end of a calamansi or pomelo tree. This foreign traveler was claiming that the needle of the conventional machine is still more painful for him and that this traditional process is the one that he can tolerate more. I also took a picture of this art, obviously the patterns that the people can choose from. I realised I have really a great appreciation of anything art. Hehe. Too bad I did not pursue my first love – drawing. At 9:40AM, my guide told me that we should descend. Yes, that short! I had to leave and I had no choice. Otherwise, I won’t be able to catch the 10:30AM bus. I paid a little glance once more on the wholeness of that high village. I hope someday I can stay longer.. only I am not sure if by that time there would be a big number of tourist. Well, maybe I’d go on weekdays. I also bought native coffee from this mother and child. While we were walking down, I asked Kuya Dalingay if there are any sort of restaurant where I can pig out because obviously I haven't had a decent breakfast that day. He said that he would just serve food for me at their house when we arrive. Kalinga people by the way are known for their being hospitable. My climb buddy Dennis had mentioned this a million times after they’ve gone to this province and climbed Mt. Patukan. He was really fascinated by the goodness and hospitality of people that he really wants to come back. Arriving at Kuya Dalingay’s house, two of his children greeted us. He directed me further to the back of their house where I can wash my hands. There I met his wife holding a baby clung through a cloth (which is very common in Kalinga). This wife of him was cooking and preparing some food and then she warmly greeted me. The next thing that happened was something I would never forget. I went back inside the house and got seated next to a dining table. After a second, Kuya Dalingay appeared and delivered the food to the table. At first glance of that seemingly boiled meat, I knew I would have a problem. OMG! The smell!!! "Ah masarap yan Ma’am, cara-beef!" He answered excitedly. I really don’t eat beef, much more if carabeef. I only eat chicken and pork because I can’t stand the angus smell of it. A couple of times, I tried but I only ended up throwing it up. So this day, I would not want to really dare or else I would really get embarrassed if I did something more shameful. “Ah first time ko po kumain nito.” I replied calmly and yes, trying to be calm. I was somehow relieved by that. That rice smells really well-scented and I love that red rice of Kalinga. Perhaps, it would somehow covered the angus taste and smell. Maybe, just maybe. Kuya Dalingay left me alone and just told me to eat more. So I was like struggling that very moment and really got teary-eyed. I almost cried because it’s like I was pushing myself to eat something that I could not swallow and on the other hand, keeping myself look glad and consider the hospitality of this household. Oh, I almost did not chew the meat and I drink more water to keep away from that undesirable taste. Can you imagine that? Thanks Heavens, after a while, Kuya gave me coffee, that delicious Kalinga coffee! Wow, they really would not forget to include the coffee to every visitor that they have. And much more to my relief, a bus stopped in front of their house. I gulped my coffee once more, said goodbye and thanked Kuya Dalingay and ran hurrily. Perhaps if my friends are with me (those who know me so much about hating beef thing), they would probably laugh at me. Yeah, that kind of typical open air in an ordinary provincial mini bus was so classic! I saw a few foreign travelers but most of the people there were locals. I smiled after I got a seat. Woooohoooo! Success, I beat the time and I would be able to arrive in Tabuk City early. While on the road, I once again savored the green beauty of Kalinga. If I remembered it right, I did not sleep throughout the trip even if I might be tired already. I savored the freedom – I did not care about the time except the practical bus schedule of the place (and minded that I had to stop the bus in Tinglayan poblacion and get my long pack from Sleeping Beauty Inn); I did not care anything about myself, even if I had a lot of insect bites, despite the uncombed hair, despite the weary sandals and dusty clothes. I only care about life, and all the good things it has to offer. As we went on the trip listening to music, with the bus picking up and dropping off the passengers, I might have been looked alone, but that’s not true. I never felt that I was alone the entire trip. God might have answered my prayers to guide me as I venture into this solo backpacking. I said to Him, “Lord please let me encounter people like good Samaritans.” And He did! Maybe, as mentioned earlier I was really, really used to a long trip being alone because it’s similar to whenever I go to my far away hometown in the province. So everything felt the same except the “feels” of being in an uncommon place. Oh well, you might imagine this moment of being emo. Who cares! It was my moment. I owned that moment. And I think it’s a gift, a sweet opportunity to be alone and know myself more… and reflect. At 2:30 PM, we arrived at the city proper, I could now see the interior of St. William’s Cathedral and the carabao landmark of Tabuk. In a hurry, I looked for somewhere to eat. I was seriously hungry… for rice!!!! Fortunately, I was able to see one right away. I sent a text message to the friend of Buddy Dennis whom from what I know was supposed to receive and accommodate me for a night. He was really residing in Tabuk. Waaaaah, I called and waited for him for almost two hours but I did not receive any reply. I had no choice but to look for a hostel. I became half-hearted between Davidson Hotel and Grand Zion Hotel. In the end, I chose Grand Zion. At least, even if I wasn’t able to have a free stay, I got a chance though to have my own place where I can move on my own. Who would not feel relax at this comfy kind of room? Tomorrow will be another day. “Me” time is over. I prepared my things and geared up. I would be meeting my fellow volunteers in TREK (Trails to Empower Kids) the next day. Another adventure awaits! We’re off to a village called Buaya in a town named Balbalan. Thanks to last night’s dream, I found myself awakened at 6 o’clock in the morning. Well, I already forgot that dream but what I coud remember is that I was really rattled, that’s why I instantly woke up. Oh, my alarm did not actually ring. After a few seconds, I saw my friend Lira and fellow volunteer for TREK Kalinga calling me on the phone. She said, “we’re already here!” Lira, who’s into many volunteering activities and also a mountaineer, was the one who invited me to this outreach. I immediately moved to the bathroom and had a light breakfast afterwards (well, there’s still bread in my bag). I planned to look for somewhere to eat breakfast when I checked out. I also contacted the other friend in mountaineering named Joseph. They were there in Davidson Hotel. So you would say, it was better if I checked in that hotel but it’s okay, I slept and rest comfortably in Grand Zion. I just bought some trail food such as biscuits, chocolate and water from a sari-sari store and finally met the TREK people in front of Davidson Hotel. A truck and a bunch of goods for distribution greeted me. Lira invited me for a breakfast inside the hotel as that breakfast was prepared for the volunteers. The guys started to fill the truck and everybody was getting ready for departure to Buaya Village. So this was expected to be a whole lot of adventure. I think the most comfortable ride that we could ever have for that outreach was the jeepney. Otherwise, it was the two trucks of goods where we can ride and mind you, it’s open. But being the adventurous people that most of us are, we actually enjoyed the truck ride and even those in the jeepney went on topload. Hehehe. Half of the trip was smooth and half was rough road. Buaya village is really remote. Arriving at this point, we were not able to move on as there is some constructions being done. We had to start the trek from here and only one or two jeepney with only goods and backpacks to load. We first had our lunch. After that, the trekking began and it never became that easy. We had to cross the bridge and unfortunately, the hanging bridge is very old and not good enough to handle more people to cross. Some used balsa and that was an epic try as they almost sunk riding on it. Some actually crossed the river. Some crossed the old bridge one at a time but it was too scary. How about us? First, be amused of this so-called Buaya-Express… and it was the one who did not only let us cross the river but also transported us to the next stop which made us shortened the trek. But hey, it wasn’t that easy. That moment when when were like stucked in the river and the water was forming a sort of a fountain while its motor was struggling to move amidst the water, whew! It was really scary… but we survived hehe! After crossing the river, it started to rain and riding in Buaya Express? Well, it saved us from muddy trails. Haha! So I was here together with the locals with their dogs and chickens. I believe this is their normal daily life when they transport things from and to their village. I guess I got a “feel” of what they normally do . And this is the life in the far away province. Nevertheless, I am really amazed of the hospitality of these local people – how they took care of us while in that vehicle and they were concerned particularly when the heavy rains poured. After arriving at the house where our backpacks are, each of us got our things and began trekking. I think it was more or less one hour from that point. That short trek was good. It may not be too much of ascent just like in mountaineering but it was definitely fun passing through rivers, hanging bridge, small villages, grassfields, forested trails and many more. The locals also helped us to transport the heavy plastic of goods for distribution/outreach. At last, we arrived at Tawang Elementary School. The teachers who happily greeted us arrive were very hospitable (expectedly surprising)! So what delighted us the most despite the tiredness? We were offered and served with coffee! Yippeee! For a while, I helped some of my co-volunteers to record and receive the outreach items. Afterwards, Lira and some of our buddies and meal groupmates looked for a room where we can stay. It’s a free time anyway! So we enjoyed the rest as well as non-stop talk with new-found friends, although some of us helped in the repacking. Another savoring moment by the way. So we were staying in a room of a public elementary school. I reminisced those times of being a pupil in our own province. It’s similar to this. A lot of posters and encouraging words around, a lot of books and there, the table of the teacher. I remembered that time when the only dream that I had was to become an elementary teacher someday. And from that dreaming scenario, I was actually planning what my classroom would look like. I smiled secretly. Yes, after this was a battle and journey through being an educator. I seemingly got a confirmation from heavens, really, this is where and what God is preparing for me. We slept soundly with each portion on the floor using our own mats and sleeping bags. This is the day of official outreach! So I thought that this school where we stayed or the community nearby was the only one to whom we will be extending some generosity. It’s not! Some local people even traveled a kilometric trail from afar. So parents and children had started to arrive early in the morning. After having our breakfast, we started also assisting to arrange the goods and other items for distribution. At some point, we would come near the kids or having some short activities led by other volunteers. The Kalinga people, generally brown complexioned, are beautiful in their own ways. And I guess, majority are both beautiful inside and out. The program started at around 10am. Led by the faculty of the school, it was the usual prayer, national item and opening remarks… but the distinct one is their Kalinga song. Afterwards, a lot of presentations from each of the school represented by both children and teachers were showcased to us. They proudly presented to us all their rituals such us peace talk and signing of agreement (budong, lunok, pagta) as well as their ethnic song accompanied by the very folkloric sounds of their instruments (Tongatong, if I remembered it right, it uses bamboos and hits the ground to produce a music). Kalinga people boast in a very nice way of their rich culture that they claim to make it pass on to their descendants to preserve it well. They are very proud of the peace talk and how they handle well their conflicts with other tribes. I was totally amused by the kids who performed as well as the effort of the local adult people. What an effort, really! I got teary eyed. And just when we thought that it’s over, there were still more presentations such as for thanksgiving for visiting them and for prayer/blessing of everyone present there. And wait, there’s more, I became even more overwhelmed when the host mentioned bout the pig that is about to be killed. And there I saw some locals helping each other to bring that shouting pig and making it ready to be cooked. Poor little thing.. I mean poor big pig! Hehee..
How hospitable are these people. “Feeling ko natapatan lang nila yung lahat ng dinala namin for them.” I told to myself, "Sobrang naiiyak talaga ko!" Too much emotions but I couldn’t deny the overwhelming feeling. After having lunch and everyone was happy, games started among young and adult kids. I volunteered to monitor in some of the games. After that, distribution of the items started. Every kid started to get on the line and wait for their turn. These are the snapshots of teddy bears being distributed. This is the product of Lira’s advocacy to sew teddy’s called Create Hugs. According to her, having a Psychology background that she has, she really wanted to initiate something that could benefit the kids and that hugs are known for its good psychological impact to a child. And those who volunteered to Create Hugs (just like me! Hehe), well, they gave so much joy for every recipient child from their labor of love. Another series of huddle and continuation of program happened next. As part of the conclusion to the program, those kids who won the games and other contests were given prizes. After the whole program, we bid goodbye to the children who also needed to go home before dusk with their parents to their respective barangay. The volunteers' next stop was the river and each enjoyably had fun washing up and relaxing while bidding goodbye to the locals and kids passing the hanging bridge above the river. What a very overwhelming and touching day it was! We had some socials at night but at 10PM I left my companions and reward myself with enough sleep. It’s time to part our ways! Good things must really come to an end but the better part is that good memories and experience are what we have gained from this outreach. Trekking the same trail on our way back, we kept in our hearts all the sweet memories and discoveries that we had. I learned that the name of the river is Car-uwan river (if I have heard it right from the locals whom I asked to). Perhaps this is also connected to the famous Chico river, I said to myself. The trip back to the city was something of struggle. From trekking deep and muddy trails to a very bumpy ride, I think all of us, the 60 volunteers, had to fit in with now only 2 trucks (no more jeepney). It wasn’t that sunny however, still it was a direct exposure to the sun with occasional drizzle. We might have struggled and yet we are truly fulfilled! At 3PM, we’re back in Tabuk particularly in Davidson Hotel where we tidied up ourselves and had our lunch. After some group pics, we need to left for Manila. At 6:30 PM, the journey back to reality began. What do you think of my "Explore, Pray, Love" experience? Hehehe! I would say -- what a great backpacking experience that I can keep to my heart throughout my existence!